Summary: Shunned at school because he sprouts flowers every full moon, Rink Bowagon makes a special pair of shoes for a classmate who is able to appreciate his unique abilities. Why is the boy holding flowers? Why is the boy holding green shoes? Is it important that there is a full moon? 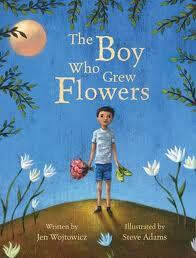 How did the boy grow flowers? Why is his house on a hill? Next read aloud the first several pages of the text. Stop after you read Angelina's question to the class, "Why won't anyone talk to him?" Since the "question rattled in their minds," allow students time to think about, discuss, or journal their own answer to this question. Then invite students to pretend that they are Rink's classmates. Have students answer Angelina's question out loud. Reread the part of the story that explains that the Bowagons lived on Lonesome Mountain. Remind the students that the "townspeople argued as to whether it was because they were such strange folk that they lived there, or whether it was because they lived there that they were such strange folk." After discussing these two ideas, invite students to divide into two groups of townspeople based on which idea they agree with. Encourage the two groups of townspeople to "argue" about which opinion is true. Invite students to discuss why Rink sprouts flowers when it is not a full moon. Then invite them to close their eyes and think thoughts so pleasant, that they, too, could spout flowers. Next lead students through the process of drawing a self portrait. Direct the children to draw flowers sprouting from their heads. A sentence about their happy thought can also be added to the paper. Each child should draw his portrait with pencil, trace the lines with permanent marker, and then watercolor paint the image. My students' discussions made me so happy, I thought I would sprout flowers from my head! Also, I found lesson plans about drawing portraits on www.artsonia.com. (Just create an account and then login to see lesson plans.) I believe that seeing the images in lesson #2711 really helped my artists. Enjoy!